In this article, we explore seven home security myths most people believe. Believing these will most certainly put you at risk of a break-in. Not true! Every year in the U.S. 3.7 million burglaries occur on average, according to the U.S. Department of Justice. Burglaries happen every day to people who thought it would never happen to them. Do not become a statistic. Home security is more affordable than ever, and there are a variety of home security systems that you can choose from. They range from monitored systems to home automation systems that control security, lights, and more. The average cost for home security monitoring is only $30 per month according to the US News. The range in price for monitoring was $15-$100 per month. To put this into perspective, the average American worker spends nearly $15 per week, or $60 per month on coffee, according to American Coffee Habits. This has to be one of those gold medal security myths. Oddly, burglars regard a dog in the home in much the same way they regard a human in the home. Burglaries often take place when homeowners are in the house. While dogs increase the risk of being detected, they often do not always thwart a willing burglar. According to the U.S. Department of Justice, on average 1 million homes are broken into while the home is occupied. The term for this type of burglary is home invasion robbery. Out of those 1 million burglaries, 266,560 turned into violent crimes, even when the burglar was unarmed and the person in the home had a gun. Burglars are intent on stealing your things. 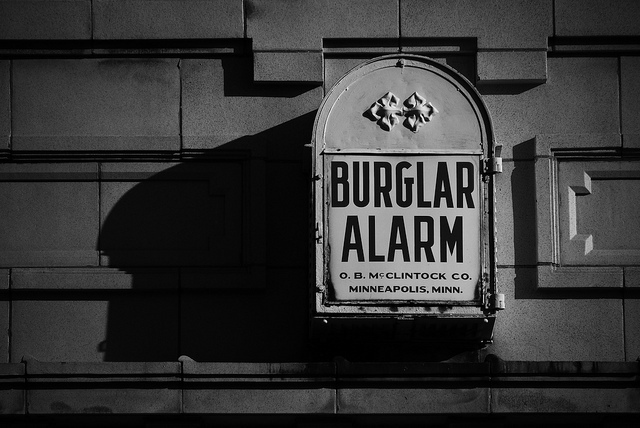 Nothing can truly stop a willing burglar, including a burglar alarm. However, burglars pick their targets based on the risk involved versus the chance of getting caught. According to the San Jose Police Department, a burglar alarm dramatically increases the risk of getting caught, and as such, would-be burglars are more likely to pass by a house that has an alarm system. Police and other law enforcement agencies recover stolen property all of the time which they cannot return to the owner, simply because they have no idea who the owner is. With electronic equipment, it helps to engrave each unit with your drivers license number so that police can then search the number and find you, says the San Jose Police Department. If you have not recorded serial numbers or engraved your property, do not expect to have it returned to you. Possibly one of the biggest security myths around. There are many studies out there which indicate that burglars return to the same house time and again. The familiarity of a property makes it a handsome target. Easy entry and easily fenced stolen goods are both reasons burglars return to a home they have already burgled. Is your home secure or are you an easy target for burglaries? Busting these security myths will help you decrease the risk of becoming a victim of a home burglary.